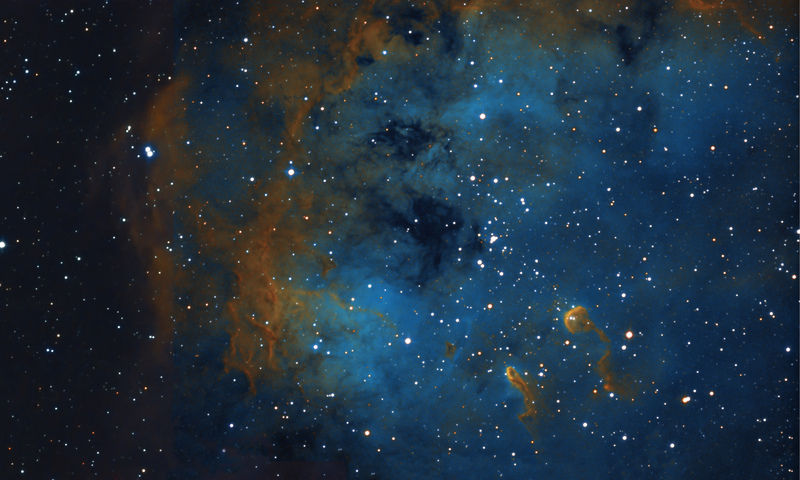 This is a narrow band image of IC410, an active area for star formation. Below and to the right of center are two structures known as ‘The Tadpoles’. Composed of denser cooler gas and dust, the tadpoles are around 10 light-years long and are likely sites of ongoing star formation. Sculpted by winds and radiation from the cluster stars, their heads are outlined by bright ridges of ionized gas while their tails trail away from the cluster's central region. This is a 16 hour exposure consisting of two images joined together to give a better perspective. Taken January 30-Feb 8, 2017.